Simphiwe Mahlanyana is the only real Capetonian on the CIELARKO team – born and bred in the mother city. He has a certificate in Public Management from Regenesys Business School, Sandton, Gauteng and a certificate in Office Administration from Rosebank College, Cape Town. His engagement background is diverse: from working in retail in his study years, through doing guest relations and marketing for the Two Oceans Aquarium to coordinating projects at an NGO building diversity skills for children and youth in South Africa. Simphiwe is passionate about community development and behavioral change. He is always seeking an opportunity to work with the youth to not only understand the problems each youth encounters in their daily lives, but to be part of the everyday “solutions”. 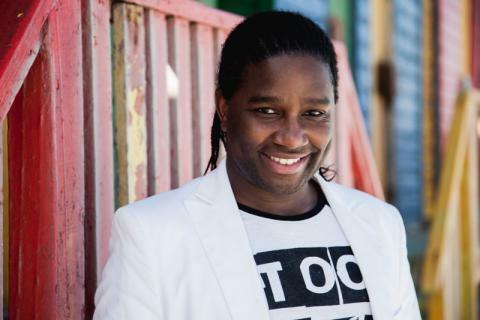 Apart from his work at CIELARKO, Simphiwe is currently doing freelance work teaching Xhosa and soft skills as well as coordinating community handball workshops and tournaments. He is also a singer and entertainer.